Multiple progressive groups, donors, and a powerful public relations firm are supporting student-run social media efforts to combat gun violence and helping to promote a March rally, which is being planned in the wake of the Parkland, Florida school shooting. In the immediate aftermath of the Feb. 14 high school shooting, a group of student survivors sat together in a circle at one of their parents' homes to plan a trip to meet with lawmakers in Tallahassee, Florida, BuzzFeed reported. During the students' conversation, they strategized about what media outlets they would be talk to, but today several major players and organizations are involved, including Everytown, Giffords, MoveOn.org, Planned Parenthood, and the Women’s March Los Angeles. The organizations are helping students with funding, logistics, and strategy in anticipation for the "March for Our Lives" event in Washington, D.C. next month where advocates plan to continue calls for increased gun control. The Stoneman Douglas High School shooting prompted backlash from some students and gun control advocates against the National Rifle Association and gun industry for being "complicit." 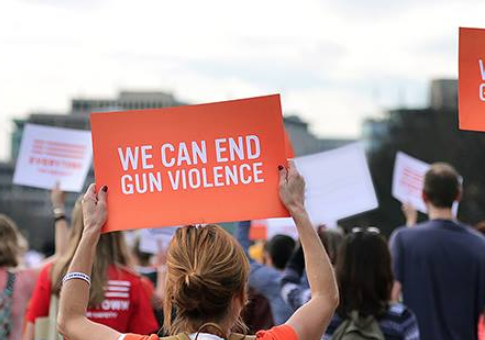 Giffords, a gun control organization founded by former Rep. Gabby Giffords (D., Ariz.), is coordinating with Everytown and Moms Demand Action for Gun Sense in America to organize the main march next month. A Giffords spokesperson told BuzzFeed that they "will be lending support in any way the students need, especially helping to operationalize these marches from logistics to programming." "We applaud these students for demonstrating incredible leadership and demanding that our lawmakers do more to help protect Americans from gun violence," the spokesperson added. Other progressive organizations have become involved in other ways. Planned Parenthood's spokesperson said the group is "teaching and hosting trainings" for young activists around the United States "to keep momentum going so they don't get burned out." MoveOn.org, a progressive public policy advocacy group, said it is focused on promoting the March for Our Lives movement on social media and would provide support in organizing logistics such as security. Democratic Rep. Debbie Wasserman Schultz (Fla.) said she has been speaking with students from the high school school and emphasized the importance of communication strategy. Deena Katz, a co-director of the Women's March Los Angeles, filed a permit application with the National Park Service for the "March for Our Lives" rally last week, but there are still many details about the March 24 event that are unclear. A spokesperson for the National Park Service told BuzzFeed on Monday that the permit has yet to be granted as they are "still waiting for the organizers to settle on a location." Public relations firm 42West has also come onboard to help "the March for Our Lives group manage the flood of media inquires that their campaign has attracted," a spokesperson for March for Our Lives said. "We are so busy helping the kids manage the hundreds of media requests they've received to talk about what can be done to end gun violence that we really don't have time right now to get into all this procedural stuff," a spokesperson for 42West said in response to a list of questions from BuzzFeed. "And in any case, a lot of the things you ask about, like the foundation’s structure and the kids’ long-term plans, haven’t yet been worked out." This entry was posted in Issues and tagged Education, Gun Control, Guns, Planned Parenthood, Women. Bookmark the permalink.